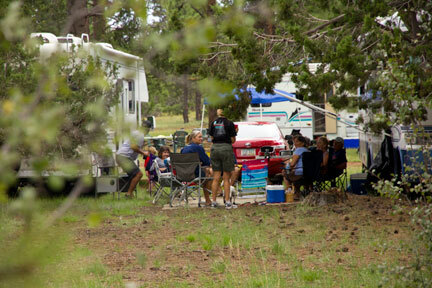 The Kinnickinick Campout in the cool of the pines near Mormon Lake is a long-time AYC tradition, but last year it barely had a heartbeat. Steve Nahkala was the only AYCer to show. This year, Steve decided he’d step up and give the tradition a pop of CPR. It worked. With people scattered over the campsite, I could never get a clear count, but this time the even drew about three dozen people, most recruited or cajoled into making the trip by Steve and Dennis Lynde. Dennis knew that Maryellen and I aren’t campers, so he offered to bring a tent for us if we came. We did. We’re glad we did. It didn’t hurt that Phoenix was being clobbered by temperatures over 110 all week (116 the previous Wednesday) and that when we drove into the campground the thermometer in the car read 77°. We sat through a brief rain shower (the only one of the trip), popped a beer and started dropping in on fellow campers. 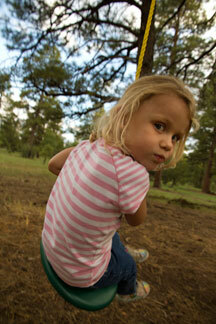 Steve had organized the traditional Kinnickinick sports: pasture golf and horse shoes. We gathered for a pot luck dinner as the sun began to set. And we gathered around a roaring bonfire as it turned dark. Steve made sure each of the kids walked away with a certificate for something. Some adults were awarded big bottles of wine. And the good feelings spread into the nighttime. There was a meteor shower for entertainment. Cool for comfort. Next year you should try it. 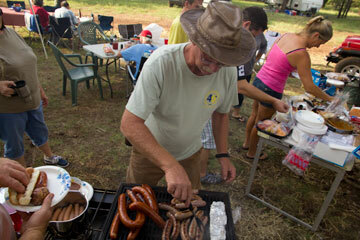 Organizer Steve Nahkala stirs up a tidy pile of sausages. 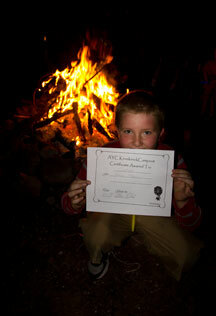 One of the certificates of achievement awarded by the bonfire.